Marcela Valladolid grew up in Tijuana Baja California Mexico. Growing up, Chef Marcela traveled back and forth across the border between Tijuana and San Diego, The two Californias, to see family and friends and for school. The book captures that rich culture that is centered on food, loved ones, and gatherings. She is the cohost of the Emmy nominated "The Kitchen on Food Network". She is also the author of other two cookbooks and the host of her own Food Network show: "Mexican Made Easy", which aired for five seasons. 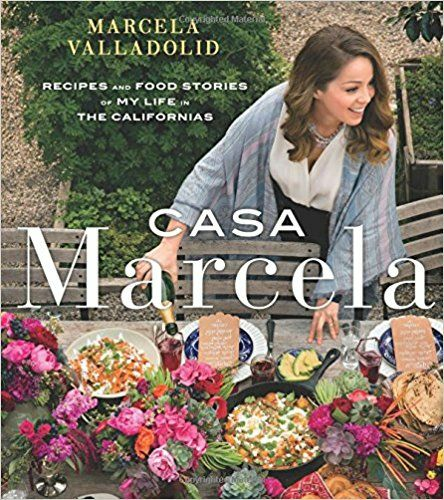 California-Mexican-style recipes and menus from the beloved Food Network host Marcela Valladolid. 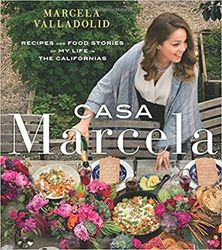 From the long-time host of Food Network's Mexican Made Easy and now co-host of The Kitchen comes Marcela's most personal collection of recipes yet, a reflection of her experience growing up in Tijuana and traveling back and forth to San Diego to see family and friends and for school. This book captures a culture centered around food, loved ones, and gatherings with mouthwatering recipes and in vibrant photography, all shot at Valladolid's home. Mexican food really is simple at its core, if you have some extra time for slow roasting meats or to prepare a few salsas, and the results are sure to impress. There are small bites like Cod Fritters with Chipotle Tartar Sauce and Grilled Steak and Cheese Tostadas; entrees such as Red Chile Lamb Stew and Roasted Tomatillo Salmon; and even drinks and desserts for special occasions, including Strawberry Layered Tres Leches Cake. With mouthwatering recipes and evocative photography, Casa Marcela presents Mexican food in a way never seen before.